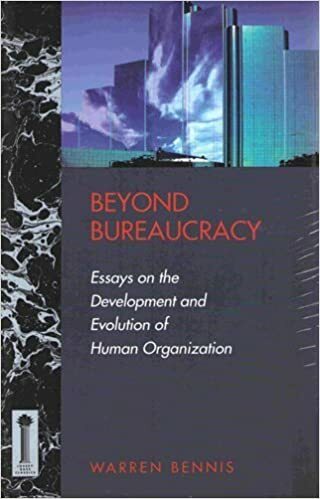 Beyond Bureaucracy: Essays on the Development and Evolution of Human Organization (Jossey Bass Business & Management Series) | Warren G. Bennis | ISBN: 9781555425227 | Kostenloser Versand für alle Bücher mit Versand und Verkauf duch Amazon. Main Author: Bennis, Warren G. Language(s):, English. Published: New York : McGraw-Hill, 1973. Subjects: Organizational change. Note: Formerly titled Changing organizations. Physical Description: xiii, 223 p. ; 21 cm. ISBN: 007004760X. Locate a Print Version: Find in a library service is not available from this catalog. Check copyright status; Cite this. Title. Beyond bureaucracy : essays on the development and evolution of human organization /​ Warren G. Bennis. Also Titled. Changing organizations. Author. Bennis, Warren G. Edition. 1st McGraw-Hill paperback ed. Published. New York : McGraw-Hill, 1973, c1966. Content Types. text. Available in the National Library of Australia collection. Author: Bennis, Warren G; Format: Book; xiii, 223 p. : ill. ; 23 cm. Buy a cheap copy of Beyond Bureaucracy: Essays on the... book by Warren G. Bennis. For over two decades, Beyond Bureaucracy has helped both modern academic thought and current management practice with its far-reaching examination of the causes and... Free shipping over $10.